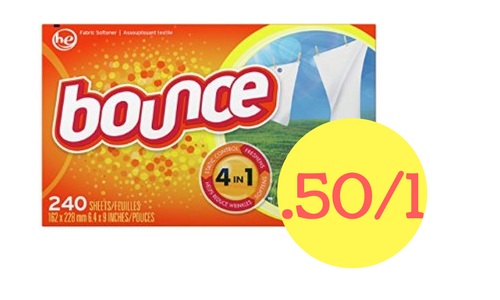 Home > Printable Coupons > Bounce Coupon | Dryer Sheets For $6.99 ea. Bounce Coupon | Dryer Sheets For $6.99 ea. Head to Target and get Bounce dryer sheets for $6.99 when you pair in a printable coupon with a Target gift card deal. This deal is for the 240 count boxes of Bounce, so you will have plenty for your laundry area!